Whew, that is a long title!! 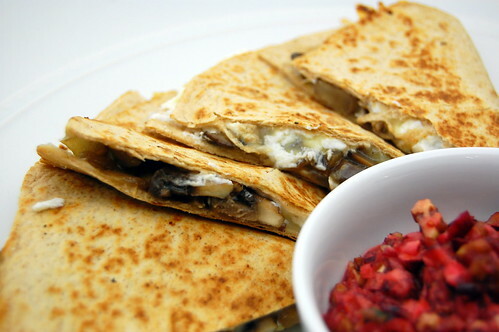 But I really couldn't leave anything out and still convey the awesomeness of these quesadillas. I know it might sound like a strange combination, but these are truly delicious. 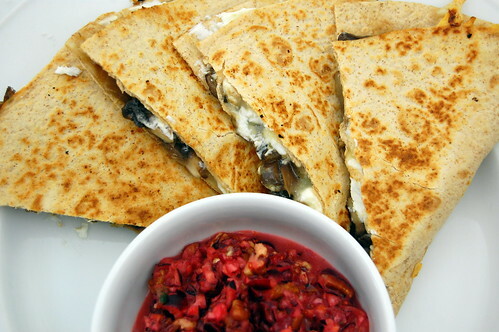 Goat Cheese and mushrooms are just made to go together (ok who am I kidding, goat cheese is made to go with just about anything), and the earthy mushrooms really play nicely off of the sweet-spicy salsa. I recently bought The Pastry Queen Christmas, and this recipe just jumped right out at me. I'm continuing my love of her, and I'm also continuing only to make savory recipes, haha! While this was one of my favorite dinners that we've had in awhile, Joey was only semi-pshyched by it. And that's okay, I knew it might be a little girly and out there for him. I will be making this again for myself... I think it will be a great lunch. And I know its something Caroline will eat - mushrooms are her new favorite food! I also think these would be a nice addition to a holiday spread of appetizers. The salsa is so pretty and festive, and everyone loves hand-held food! 4-6 main course servings, or 24 appetizers. Preheat the oven to 350. Arrange the pecans on a baking sheet and toast 7-9 minutes, until deeper brown and aromatic. Cool, and coarsely chop. Combine the vinegar, olive oil, sugar, mustard, orange zest and juice, and salt and pepper in a food processor. Process until well combined, about 30 seconds. Add the cranberries, shallot, and jalapeno, and pulse to coarsely chop. Transfer to a bowl, cover, and refrigerate. When ready to serve, fold in pecans. This looks delicious and like a great party appetizer! What a great combination! That cookbook is definitely on my Christmas list this year- I love her first book!